This page tells about the experiences our grants contributed towards. Clava and Càirdean are two youth traditional bands which were formed in late 2014 and organised by Alison Mackenzie. The bands rehearse weekly and this dedication resulted in success at several festivals in 2015. It is important for youth bands to have the opportunity to work with professional musicians who can inspire them with their passion and enthusiasm for the development of traditional music. 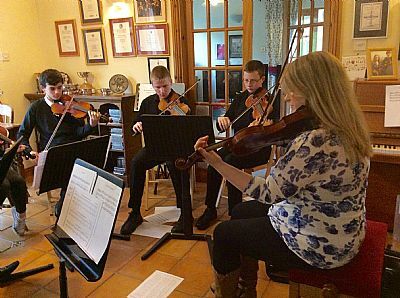 In 2015, a grant from the Friends of Highland Music gave the bands the opportunity to work on arranging a set of tunes with two members of the Scott Wood Band prior to their concert in the Inverness area. Scott Wood is an innovative young piper and has just released his first CD to great acclaim. Mhairi Mackinnon plays fiddle in the band and is an accomplished musician. This gave the band members a chance to discuss their ideas and contribute to the final arrangement. The tunes which formed the set were: Mo Ghaol ’s mo Ghràdh ’s m’ Eudail thu, a slow Gaelic Air, followed by two jigs, and unnamed Irish jig followed by I have It Somewhere. The finished set took into consideration the different levels of ability of band members and allowed everyone to contribute to the overall performance. It was an extremely valuable experience for the bands. 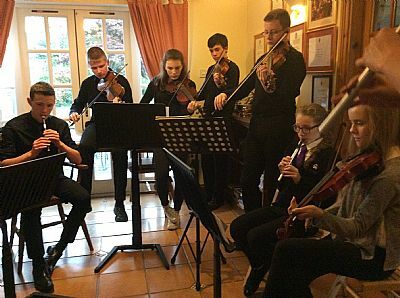 Their performance at the concert a week later was a credit to them and to the teaching and encouragement they had received from Scott and Mhairi. Scott remarked on how quickly the bands learned the arrangement and the high standard of their performance. He left some other pieces for the bands to work on which will used for a future performance. 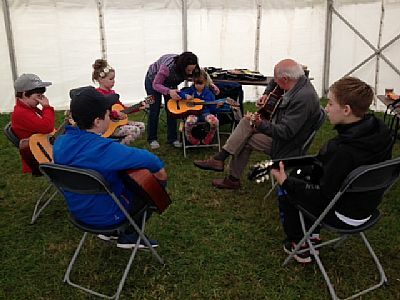 Friends of Highland Music sponsored a small Traditional Music Marquee at the Festival to allow tutors to offer Come and Try Sessions for children and p arents attending the Festival. Irene Fraser tutored fiddle, Iain H Ross bodhran and Jeff Maclean mandolin and guitar along with Lorna Maclean (bodhran) and Ann Marie Downie (guitar). 100 students attended on Friday and 131 on Saturday. The event was considered a great success and hopefully can be repeated in the future. In April 2015, Kerr Macdonald from Gollanfield near Nairn attended this week long residential course at Drumnadrochit. 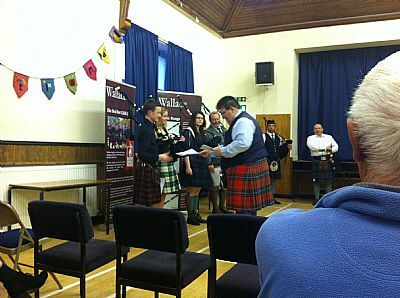 Kerr was in the advanced group which included a pipe band from Belgium. 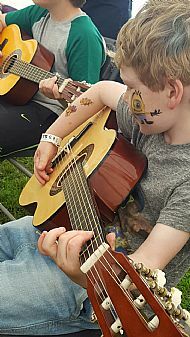 There was a mixture of band and individual practice with a selection of new tunes taught such as The Banjo Breakdown, Tug Argan Gap,The Hills of Perth and The Glenfinnan Highland Gathering. There was an opportunity to take part in a workshop showing pupils how to build reeds for pipes, and another class to learn a Piobaireachd. Kerr gained much experience from the piping week, not only from learning a number of new tunes in the regular and Piobaireachd classes, but also the whole week raised his confidence and he made new contacts. 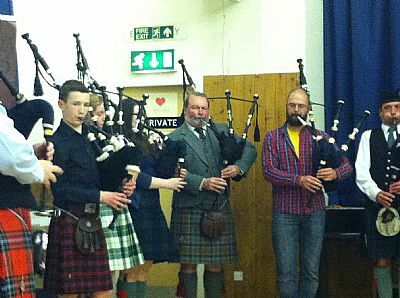 The College held a Closing Concert at the local hall on the final evening which all friends and family were invited to – it was a most enjoyable evening with pipers of all ages, the youngest piper was 10 years old. Kerr was presented with a certificate to confirm that he had completed the Highland School Course 2015 (below right). 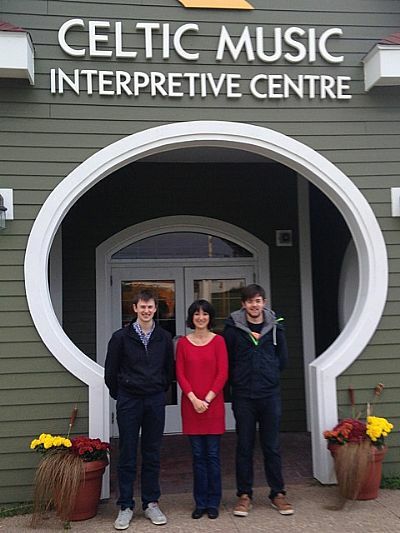 In October 2014, brothers and fiddlers Graham and Robbie Mackenzie from Inverness travelled to Cape Breton to attend the Buddy McMaster School of Fiddling. It is a famous and prestiguous event and Robbie and Graham did well to be accepted on it. Over the five days, I received tuition from ten of Cape Breton’s finest fiddle players: Shelly Campbell, Wendy MacIsaac, Kimberley Fraser, Mairi Rankin from Beolach, JJ Chaisson, Glenn Graham, Andrea Beaton from the Panache Quartet, Rachel Davis and Colin Grant from Còig and one of my favourite fiddle players, Troy MacGillivray. Each of the tutors offered something different to one another and hailing from all over the eastern side of Canada they brought their own styles and unique musical backgrounds and influences to the teaching of their selected tunes. The ten tutors all taught a variety of tunes and ornaments, such as warbles, turns and cuts. The tutors played a twenty-minute set each at lunchtime, in the restaurant. These lunchtime performances gave me my first taste of the Cape Breton style of piano accompaniment, which takes a heavy influence from the walking bass line of Swing and the syncopation found in Ragtime piano music, whilst using the full range of the piano, varying greatly from the style found here in Scotland. Two different tutors were assigned every day and they would take it in turn to take each class. I attended the advanced class for the week which on the whole was taught by ear. This is certainly the preferred way of teaching traditional tunes as it is easier to memorise the tune as opposed to learning it from the sheet music. All of the repertoire we learnt throughout the week were either traditional Cape Breton tunes or the tutor's own compositions. Often the traditional Cape Breton tunes that were taught had a link to Buddy MacMaster, whether it was tunes he loved playing or had recorded on CD. As the class was fairly advanced, we were collectively able to learn as many as five tunes by ear in the two hour class. Once the classes were finished for the day, the students got the opportunity to showcase their talents. I played on several occasions. The tutors remarked on my playing and were interested to see the differences and similarities between the Scottish and Cape Breton fiddle styles. Clarsach player Abigail Miller Todd attended the 12 day International Music Course in Lancut accompanied by her Mum Mari. We began with a road trip to Edinburgh Airport, all ready for an early (3:30am) start the next morning. It felt surreal to be wandering around the airport in the simmer dim in the quiet pre dawn. Arriving in Krakow, we were horrified to see monsoon conditions instead of the promised hot weather, leading to a swift change of plan and a taxi to the railway station, happily housed in a large subterranean shopping centre. We were astonished when an early 20th Century train clanked its way up to the platform. Once aboard we quickly realised the train had a maximum speed of about 20miles an hour and stopped at every remote and rural rail platform between Krakow and Rzsezow. We missed our rendezvous time but it was now hot and sunny so we waited for an hour hoping a lift might materialise. Eventually we conceded defeat and hailed a taxi. A swift drive through the countryside and we found ourselves at the front gates of the impressively beautiful Lancut Castle (above): think Dunrobin with additional wings and parkland surrounding the formal gardens. Some local girls kindly escorted us to the music school headquarters (right) where we were registered and taken to a beautiful nearby hotel where we immediately bumped in to Professor Mazurek, newly arrived from across Poland, who arranged a pre-course lesson for Abigail first thing in the morning. The first full day in Lancut began with our first lesson with the wonderful Professor Mazurek and concluded with our first big event in Poland: the opening concert. 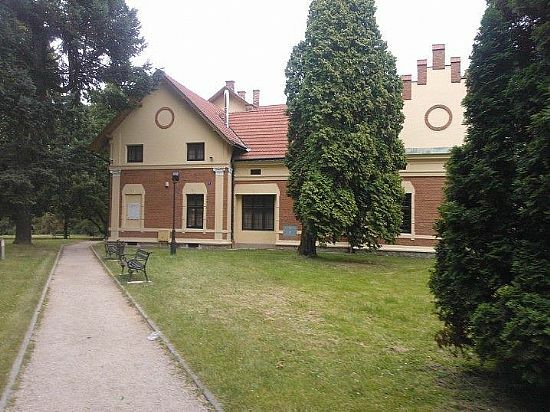 All music school participants were bussed to Rzsezow for the opening evening gala concert. We discovered that, in Poland, music trumps food, as we left at 5:00pm and didn’t arrive back until about 10pm - at no point was there any opportunity for food, and nobody seemed to mind! The concert had an electrifying programme of music where winners of international music competitions played for the enraptured audience. They were all stunning. Our days settled into a pattern: a walk across the park to the community centre where the harp teaching was based. Abigail was the first student of the day, with the lesson usually lasting for about an hour and a half (left). The lesson times were not rigidly adhered to: Professor Mazurek would keep going with a student until she was satisfied. Those waiting would come and sit at the back which gave the lessons a feel of a masterclass. Professor Mazurek taught all day until about 7pm, with a break for lunch. She often called Abigail back for lesson in the afternoon to check on progress. Although she is well advanced in years I have never come across such a committed and open hearted teacher. Her teaching was very visual, with vivid descriptions being used to help students understand the type of movement she was looking for: “Imagine you are chomping on your favourite cake each time you pluck a string” being one of our favourites. The first lesson began with thinking about posture and positioning. 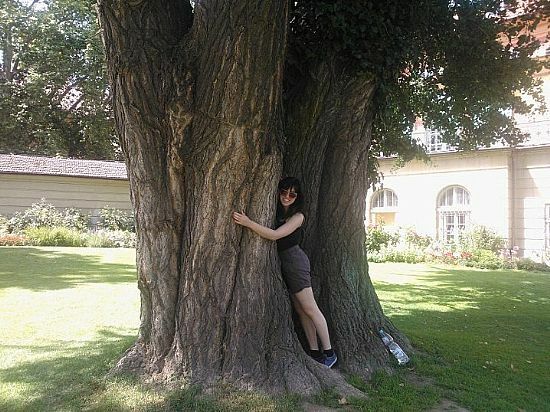 We were instructed to practice hugging a tree (below) to have a lovely cuddling shape with shoulders and arms when setting up for playing the harp. Then it was centre yourself and bring your forehead to the harp, before bringing the harp back. It shouldn’t rest on the shoulder but more balance on the breastbone as the shoulder needs to be relaxed and free to move. Once individual finger movements had been looked at and corrected, we moved on to hand movements (relaxation being key) and arm and then shoulders. Shoulders to remain down at all times! At all stages Professor Mazurek used touch to check on muscle tension and also to demonstrate what she was looking for. 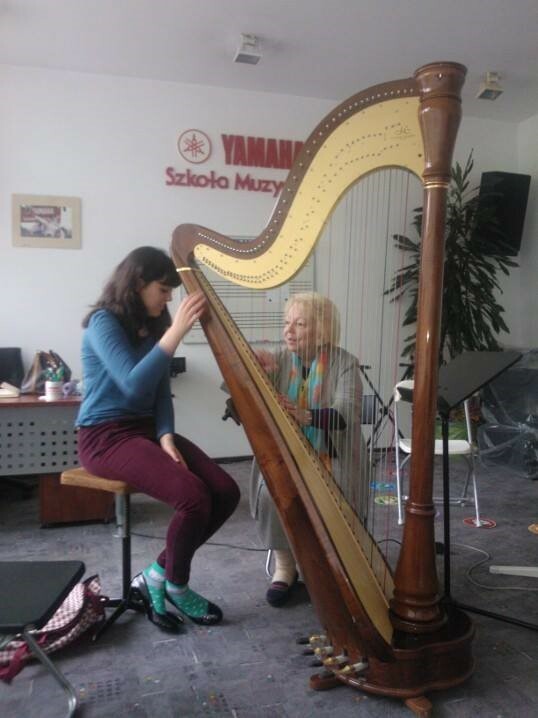 Professor Mazurek is a world expert on harp technique, having used physiology and help from her old swimming coaches to get over an injury from harp playing in her early twenties. She has looked at every aspect of anatomy and used that to develop a technique which will put the least strain on the body over time. She was also hugely entertaining and inspiring to Abigail: on our last night in Poland we joined her for dinner and she regaled Abigail with stories about the golden age of harp in Paris in the 1960’s with the most famous players of all time. These kind of insights are invaluable and immensely precious as they help to develop Abigail’s love and understanding of the harp and it’s history. When we left, Professor Mazurek gathered all the other harp players to say farewell and to present Abigail with a gift and a certificate. She also offered Abigail a chance to play a harp concerto with the orchestra if she returns next summer. Overall, the whole experience was fascinating: the seriousness and commitment to music was beyond anything imagined and the teaching exemplary. Nightly concerts in the castle ballroom castle, all free to music school participants, provided a great opportunity to hear some amazing professional musicians perform.Most interesting was the agreement across musical disciplines that all instrumentalists need fluid and looseness in their playing if they wish to produce the sweetest sounds. Beyond the music, Lancut is beautiful, the park and castle are national treasures worth a visit in their own right. 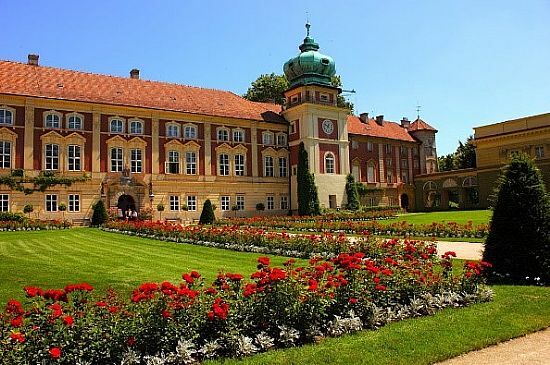 It was in Lancut Castle that Poland was signed over to the Soviet Army at the end of WWII! It is very cheap to visit Poland, food is much cheaper there than in Scotland, so it was possible to have plenty of fresh fruit and ice creams! We would strongly recommend others to consider this music summer school if the opportunity arises and would certainly love to go back if Abigail’s orchestral commitments in Scotland allow it. Thank you very much for making this opportunity possible: it has been invaluable.